Focusing on the period between the late 1950s into the early 1970s, when artist Dieter Roth produced his most innovative works, MoMA is currently presenting wait, later this will be nothing, a show documenting the artist’s unique book works. The show is titled after a phrase Roth used in Snow (1964-1969), an early book project that represented a turning point in Roth’s style, and which was highly influenced by James Joyce’s The Dead. Born in 1930 in Germany, Roth moved to Bern, Switzerland at the age of 13, where he sought asylum during World War II. In Bern, Roth became interested in Concrete art: a highly structured, systematic and geometric practice requiring a meticulous process to design and execute. Roth’s interest in this art form spawned his invention of the artist’s book as an genre of art-making, where the book itself is considered an art piece rather than a just reproduction of art pieces. 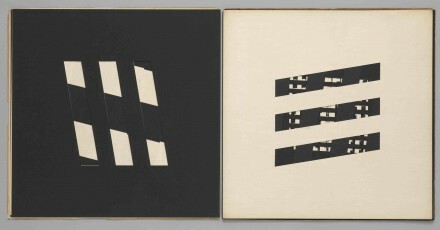 Around the same time (into the early 1960s), Roth began experimenting with language and poetry in his books, which were inspired by Eugen Gomringer’s “constellations,” a separation of language from meaning, using letters as geometric elements set strategically into the work’s compositions. The language becomes a purely visually aesthetic, detached from any previously learned meaning or sound. Another example of Roth’s experimentation with language is his Dichtungsmaschine (poetry machine), made in 1961. Capitalizing on his interest in mixed English and German, Roth experimented in making plays on words, puns, abbreviations, and acronyms that worked between the phonetic and semiotic structures of the two parallel tongues. In 1964, Roth also invented an alphabet of icons, assigning each icon a sound. His icons held multiple meanings for him, and he continued to use them throughout his career, approaching and bending the structural theories of language from yet another perspective. From a young age, Roth had learned the crafts of etching, wood and linoleum cutting, lithography, typography, letterpressing, and printmaking. 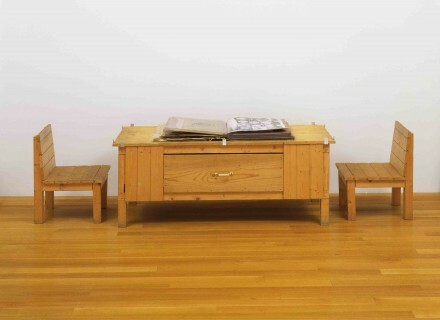 He worked at an advertising agency in Bern, Switzerland, and was influenced by commercial means of printmaking, but would also became more interested in experimenting with each of his skills to create new versions of art objects. In order to make his “pressings” and “squashings,” for example, he would send packaged food (cheese, sausage, chocolates) through the printing press, or poured juice on top of his prints. These inflections of exterior objects onto his printed works were a landmark intrusion into the structure of the printed work, abstracting it from its role as merely a piece of readable material. 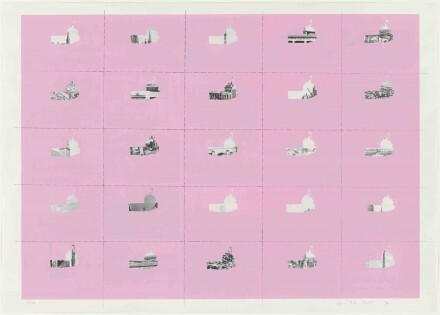 Roth’s work on the act of language conveyance would set the stage for many artists interested in the translation of language and form, particularly Wade Guyton, whose enormous inkjet-printed works bear a similarity in their emphasis on the act of transcription itself. Roth liked the idea of comparing his studio to a kitchen, from which he would accumulate “ingredients,” and use tools to experiment in making new recipes. 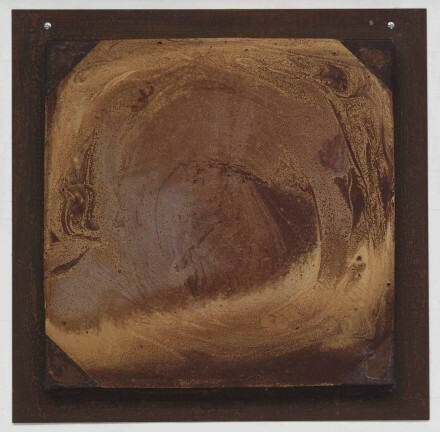 He also liked the idea that his art should not be permanent, but rather that it would eventually age, die or decay. 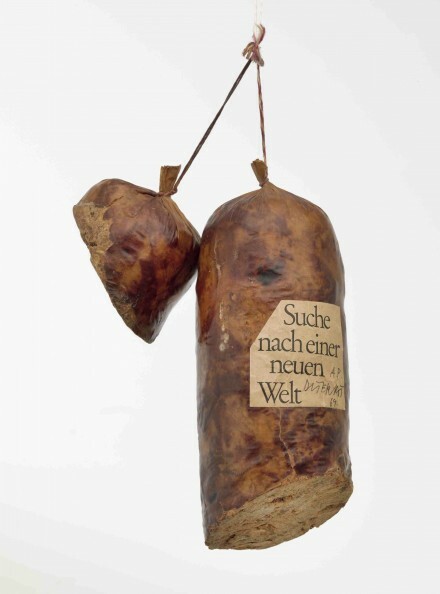 Dieter Roth, Literature Sausage (Literaturwurst) (1969), Gelatin, lard, and spices in natural casing. 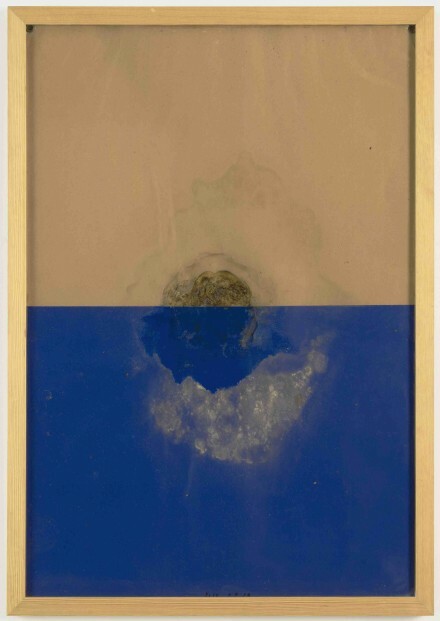 As a means of preserving the memory of his works, Roth was, however, interested in the concept of the container – an enclosing structure that provides boundaries to limit the act of chaos on his work, while simultaneously cataloguing his experimentations. 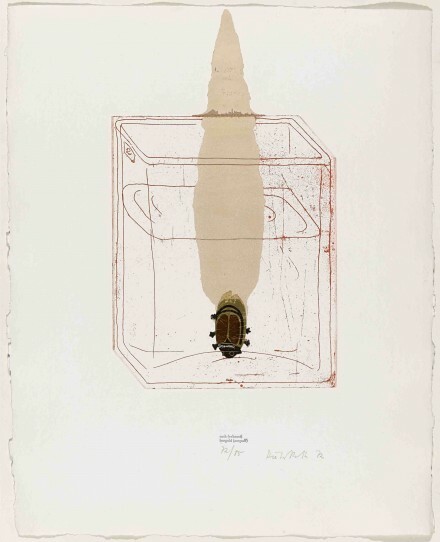 His publication of books were one manifestation of this tendency, but the artist would also create a portfolio of graphics, collages, and sculptural works built around the theme of preservation, including objects like squashed chocolate inside a glass case, postage stamps and etchings that both served as an encyclopedia of his work to date as well as a self-reflexive representation of his “repository” of experimentations. Showcasing the artist’s structural experiments in printed materials, language and understanding, wait, later this will be nothing at the MoMA New York will continue through June 24th 2013. 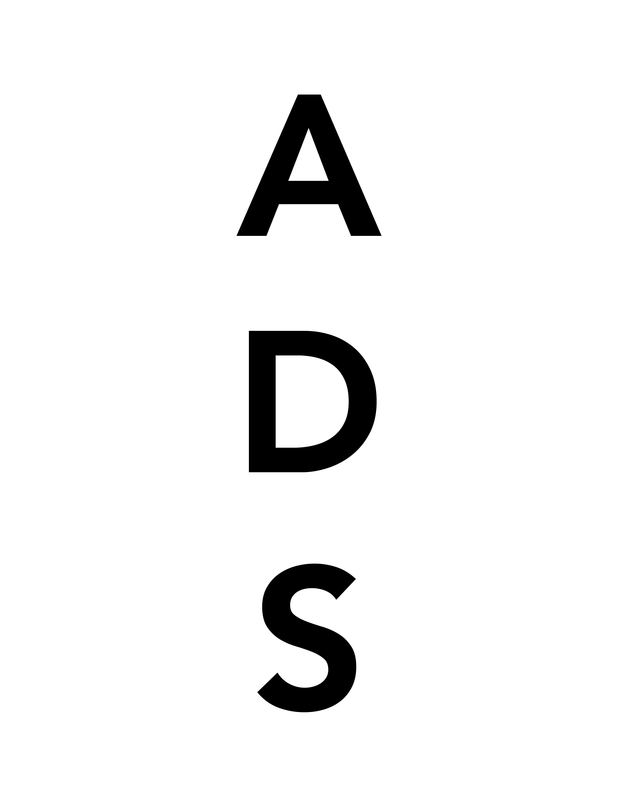 This entry was posted on Monday, June 17th, 2013 at 5:29 pm	and is filed under Art News. You can follow any responses to this entry through the RSS 2.0 feed. You can leave a response, or trackback from your own site.